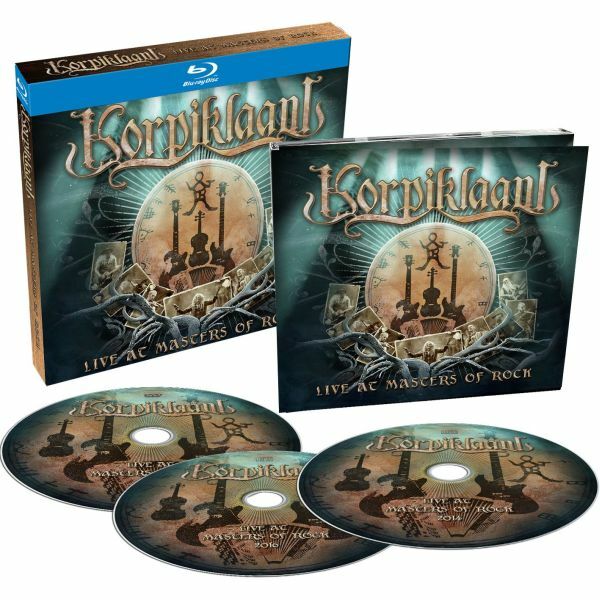 KORPIKLAANI - LIVE AT MASTERS OF ROCK (2CD+BLURAY DIGI) | Online Shop | Wizard LTD. Album: "LIVE AT MASTERS OF ROCK (2CD+BLURAY DIGI)"
- NUCLEAR BLAST WINTER 2018/ 2019 CAMPAIGN! ВРЕМЕННО НАМАЛЕНИЕ!! СЛЕД ИЗЧЕРПВАНЕ НА ОПРЕДЕЛЕНИТЕ КОЛИЧЕСТВА ЦЕНАТА СЕ ВРЪЩА НА СТАРОТО НИВО! - СТАРА ЦЕНА: 52.00 BGN!! When Jonne Järvelä first formed KORPIKLAANI, he always had a vision of perfectly combining the two music worlds he loved the most; heavy metal and folk music. His vision has finally been achieved and the results can be viewed on KORPIKLAANI’s first ever DVD/Blu-ray release. »Live at Masters of Rock« illustrates why the band have achieved fame and success around the world, becoming the Folk Metal Superstars that they are today. This debut release captures everything they stand for; pure live energy, combined with their tales of Shamanic history and Finnish culture, to their world-renowned drinking habits which have been immortalised in a few songs dedicated to their favourite drinks. KORPIKLAANI have set the standard for entertaining any audience, no matter their age, musical preference or style. KORPIKLAANI will get you dancing no matter what! Jonne was not just behind the editing of this release, he also took on the duties of mixing. As a knowledgable fan of music DVD’s he spent a lot of time working with the mastering legend Svante Forsbäck, who recently mastered the RAMMSTEIN DVD, ensuring that the perfect ambience and surround mix was achieved. Jonne‘s goal was to make the viewer feel like you are right there, live in the middle of the crowd.